If there was one word to describe me today, it would be wreck. I have literally been a wreck all day. 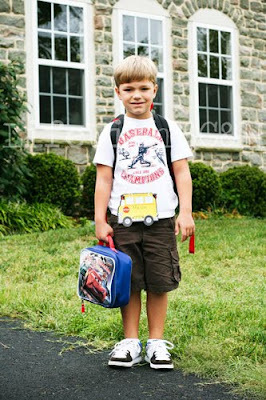 Mason was the first one to leave for school this morning. He was very excited to go to school, so there was no anxiety on his part. Me ... not so much. We all walked up to the bus stop and waited for his bus. He is friends with our two neighbor girls, so I think it helped him to know that they would be on the bus with him. As soon as the bus came, it was a mad rush of kids ... and Mason went right with them like he had been doing this for years. So funny. 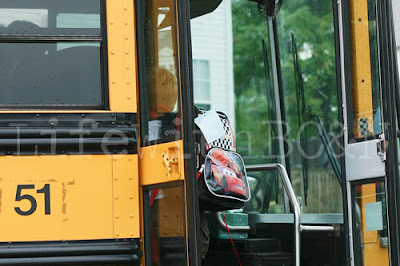 As the bus pulled off, I cried ... ahh, so many emotions. Here is some video of Mason loading the bus ... I think he thinks he is too cool for school! Payton catches her bus three hours after Mason does. I was so happy she got to see him go first and see how things work. 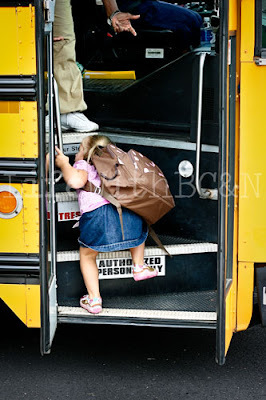 She was all trying to get on Mason's bus this morning, so I hoped she would do the same when her bus came. And my little go getter, of course she did. As we saw the bus coming down the street, she got so excited ... screaming and jumping up and down. The doors opened and off she went ... no coercion needed. WTF ... wasn't that the part that she was supposed to cling to me and not let her go? Haha. I was a mess the entire time, sobbing like a baby. 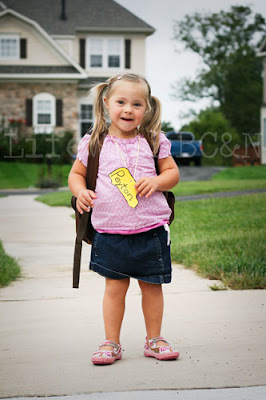 I was so proud of her for being such a big girl, yet I was so nervous for the bus to pull off with her on it. I can do this myself! I'm getting there! Still climbing! Once she was on the bus in her seat, she became a little unsure of things. The aide was trying to put her seat belt harness on her, which she didn't like. They let me board the bus to help explain it to her and she was okay. I got off the bus and she waved goodbye! And I continued to sob like a big baby. Here is the best part ... getting to see it on video. She cracks me up! 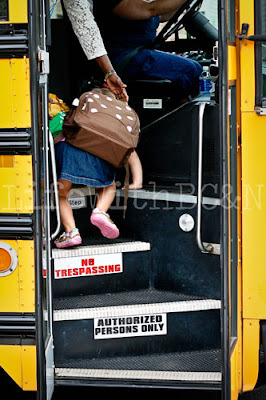 At the end of the day, the kids got off their buses with no problems to report. I asked Mason lots of questions about his day, but pretty much all I got was, "I don't know." Hmm, sounds like a great day! He did manage to tell me that some of his classmates got in trouble and would be getting sad faces on their behavior charts ... I guess that is all that boys care about? I am happy to report that Mason got a smiley face on his chart, meaning he didn't have any sticks pulled from his behavior envelope ... yay! Payton was out of it when she got off her bus, so I suspect the poor girl was so tuckered out that she fell asleep on the bus. I did not get any feedback from her teacher, so I will be asking for something like that when I talk to her. Wouldn't it be common sense to send something like that home with a preschooler? I digress. Okay Bethany, I was crying when I just saw the video of her getting on the bus, I can't imagine the emotions you were feeling. Actually, I felt the same way when I put Jessica on the bus! What a big girl, Way to Go Chicky!!! Kyle is cracking me up listening to him on the videos!! (((Hugs)))) to the mom, I feel your pain. OMG- Payton got on the bus faster than any kid I have ever seen before!!! SO adorable :) She is so funny and flapped her hands just like I did when I was a little kid and very excited. Evie does that too. I love it! Totally crying watching your kids get on the bus. What happened? When did they grow up? Payton could not have been any more excited and Mason is clearly too cool to show how excited he is. Sniff sniff. Kids just grow up too fast! Mason Is way too cool for school lol. Our kids all have to were uniforms here for Prep / preschool (your Kindergarten) seems strange to see the kids in plain clothes. Aww how cute. I cant get over Miss Payton, look at that muscle tone in her LEGS!!! It’s hard to believe watching her that she is that same age as Aden OMG! WTG Payton!. What happened to the video of you getting on the bus hahaha that would have been great. Hope you had a good day, with Addison. All I can say is, Wow. Congrats kids and Mamma. Oh Bethany...You would have heard me sobbing on the video! 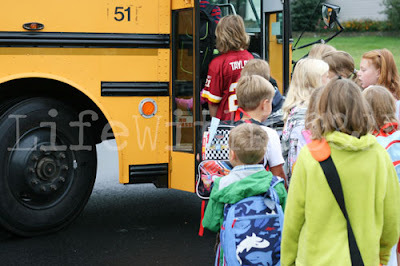 I still have problems with the bus and Jack is in 4th grade/Grace is 1st grade. I end up driving them most days. 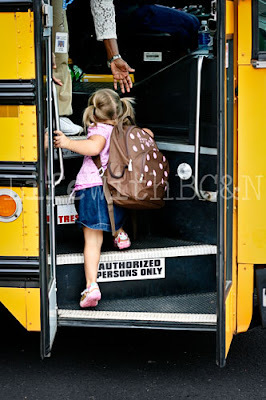 I am happy that both kids got on the bus without any problems..that is even harder when they don't want to go. 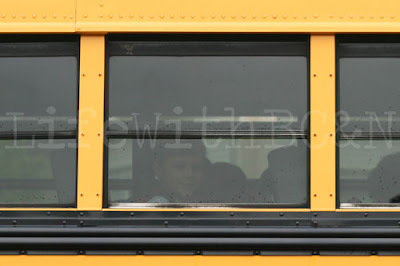 It is also nice that Kyle was so excited for the kids :)...maybe he can ride the bus someday too! I am sitting her laughing after listening to your husband. he cracks me up!! love it!! they both did so good!! you gotta be one proud mama! sometimes the transition is so much easier for the kids! I'm glad they did so well and hope for a great year! Aww, love the pics and the video of Payton had me cracking up. She bolted on the bus. Way too adorable. Thanks for sharing..........I cried too.....for you and your beautiful children and for me and my 5 month old grandbaby.........(with downs). Thanks so much for showing us how beautiful and capable these children can be. God Bless You and your family. Awe- so sweet. That is a lot of kids with Mason getting on the bus- my goodness! At least he acted like a pro! Hope to see Nika's soon! !